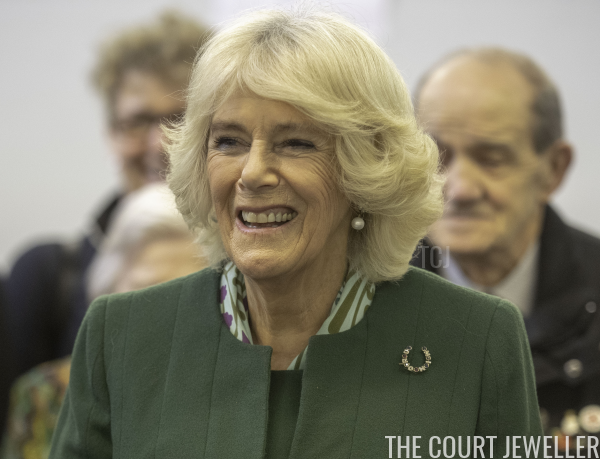 The Duchess of Cornwall undertook a series of engagements in East London on Wednesday, and she was accompanied by a very intriguing diamond, ruby, and sapphire brooch. 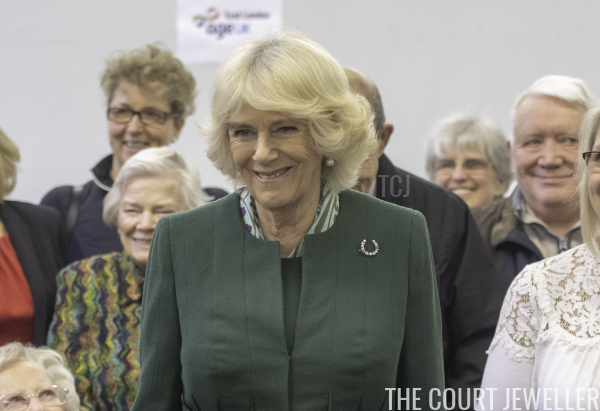 Camilla made stops in Malmesbury and Stepney during her visit. Above, she beams during a visit to the Malmesbury Residents Association, where she helped CleanUpUK pick up litter and had a reception with both residents and members of the local Age UK Lunch Club. 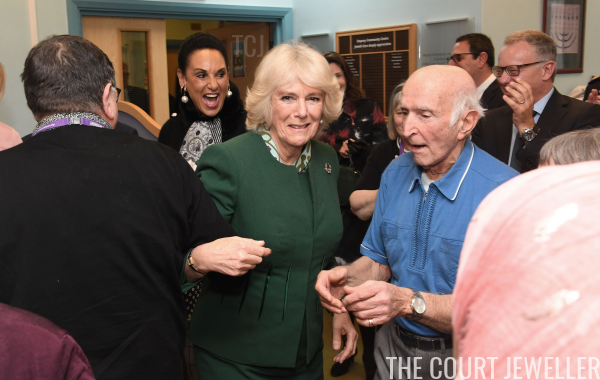 In Stepney, she made a lively stop at the Jewish Care's Brenner Centre, where she took a turn on the dance floor with several sprightly residents. 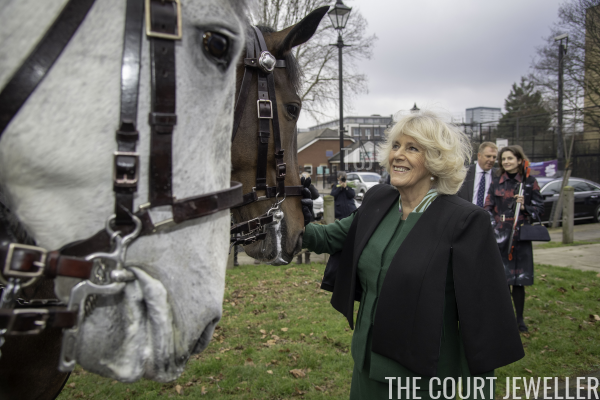 For the occasion, Camilla wore a very intriguing brooch in the shape of a horseshoe. 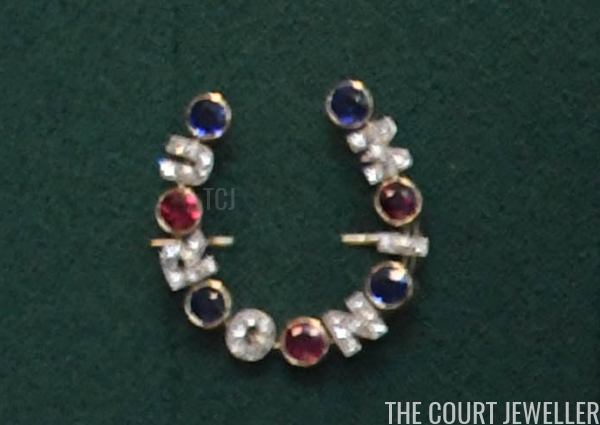 The diamond-set letters on the brooch spell out the name "Minoru." Racing aficionados may immediately spot the royal connection. Minoru was one of King Edward VII's most successful Thoroughbred racehorses. In 1909, he was one of the best colts in the country, and his win at Epsom win made Bertie the first reigning monarch to win the Derby. Minoru had also worn the 2000 Guineas at Newmarket that year; he narrowly missed winning the British Triple Crown when he was beaten by Bayardo at the St Leger. Press clippings from the time note that Edward VII had several jewel-studded scarf-pins made to celebrate his horse's grand victories. American papers especially noted that Danny Maher, the American-born jockey who rode Minoru to victory in the Free Handicap at Newmarket in October, was presented with "a beautiful jeweled scarf-pin in recognition of the jockey's success." 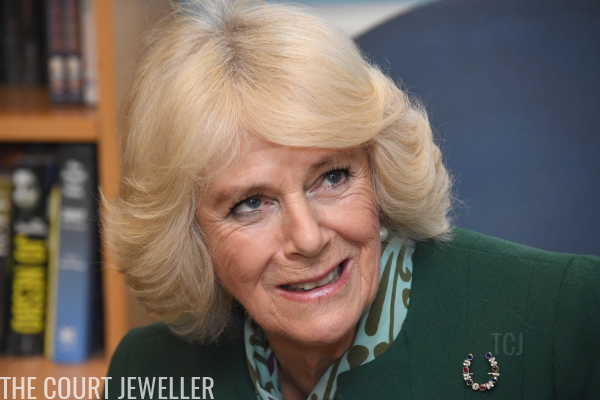 The pin worn by Camilla on this occasion features diamond-studded letters interspersed with round rubies and sapphires. Red and blue were Edward VII's racing colours. Appropriately, there was one equestrian moment in Wednesday's visit, too. Camilla, who loves horses and is an accomplished rider, got to meet police horses during her stop in Malmesbury.